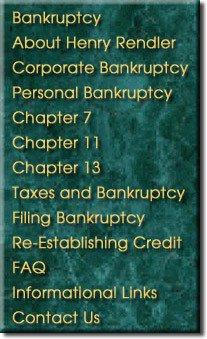 After a debtor receives a discharge in bankruptcy, creditors whose debts are discharged are required to report that the account has a zero balance. The fact of the filing itself can remain on the credit report for 10 years from the date it was filed. A debtor interested in re-establishing credit after bankruptcy should obtain credit reports from the 3 largest credit reporting agencies, (Experian, Equifax, and Trans Union) and ensure that the account balances have all been zeroed out. If they have not, the debtor should contact the credit reporting agencies and ask that the record be corrected. A debtor seeking to re-establish credit should consider applying for a secured card, usually a Visa or Master Card. This is a credit card issued by a bank to a customer who is required to establish a savings account at the bank, which is used as security or collateral for the card. Typically, the limit on the card is based on the amount of collateral put up in the form of the savings account. Often, the bank will have an annual fee. The benefit of the secured card is that banks will issue them to persons with poor credit reports in the past, but who have the ability to pay the deposit to secure the account. Other methods include buying a car from a local car dealer who advertises that it specializes in making car loans to persons with bad credit or recent bankruptcies. Also, a debtor with a personal relationship with someone at a local bank should not hesitate to seek assistance from that source. Ultimately, however, debtors emerging from bankruptcy should use their experience to avoid getting into the same financial traps which snared them before. All too often, this was the easy availability of unsecured credit in the form of unsolicited, pre-approved, credit cards. Debtors should take steps to budget properly, not spend beyond their means, and resist the temptation to incur debt beyond their reasonable ability to repay just for the purpose of re-establishing credit. Debtors should avoid being enticed by so-called "credit repair" agencies. These are often simply unregulated rip-offs, who prey on the financially-distressed, and who do nothing more than what debtors themselves can do by exercising their legal right to have their reports properly list their outstanding obligations. If you would like more information concerning the above issues or other related legal matters in the State of California, Attorney Henry Rendler is available for consultation. Please feel free to call 408.293.5112 to set up an appointment.